A bathroom is one of the most functional rooms within a home, but with a little creativity in terms of light fixtures, you can take it from boring to brilliant. Today, bathroom light fixtures are available in a wide range of designs and sizes to suit every need and budget. Moreover, these fixtures do not compromise practicality for style. You will notice bold designs and clean lines in contemporary lighting fixtures. Their style is emphasized with sleek steel or chrome finishes, although some designers prefer bronze or hand-painted finishes for a unique look. You can choose frosted or colored glass diffusers to personalize your bathroom and give it a mature or youthful look respectively. Simple ceiling lights in the bathroom are a thing of the past. They lend a drab look to the bathroom and downplay any other eye-catching decor used in the room, such as shower curtains, wall art or fresh plants. Modern-day bathrooms are fitted with dimmers or ambient LEDs to bring a soft glow to the room and allow you to have a relaxed bath; you may even fit an elegant chandelier as the focal point of a spacious bathroom. The bath and vanity area need near-natural lighting to allow proper grooming and applying of make-up. Wall sconces placed one on either side of the mirror work well to illuminate it uniformly with the right intensity. An alternate yet equally effective design is a long bar with multiple lights installed above the mirror. LED strip lighting all around the mirror creates a halo effect and gives the bathroom a celebrity look. Do not opt for modern light fixtures if your bathroom tiles, taps, and bath/shower unit have a traditional design. The lighting needs to blend with the rest of the bathroom. Many bathroom suppliers stock light fixtures in a series so that you can install various lights around your bathroom with the same theme or design. If your bathroom is compact, avoid large light fixtures like a chandelier or light bar. Opt for small, transitional light fixtures instead to make the most use of the limited space. Also, find out whether a light fixture needs to be installed in a particular direction before buying it for your bathroom, else you may not be able to use it as originally intended. 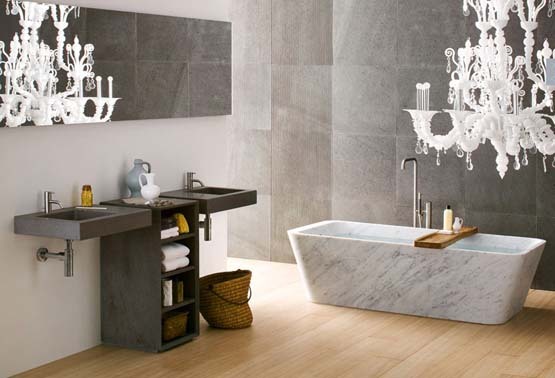 In conclusion, you can convert your regular bathroom into a lavish spa retreat by using modern lighting fixtures. While experimenting with various creative designs, there are two main things to keep in mind. The first is to maintain consistency throughout the bathroom by coordinating the lights with the walls, shower curtains and other hardware fixtures. The second is to choose light fixtures according to the size of your bathroom, keeping in mind that the right lighting can create the illusion of larger space. With these bathroom lighting tips, you are now ready to brighten up your bathroom and dazzle all who enter. Jamie Parham enjoys DIY projects and has a penchant for lighting. His articles mainly appear on home design blogs. Visit Lampclick.com to see their elegant mini chandeliers range for ideas.